Image from Christina Williams blog. Our daily tasks are just as important to order and simplify as the physical objects in our homes and workspaces. While we are still huge fans of printed calendars and lists, it seems that we are quicker to turn to our smartphones to make lists or calendar appointments as we go throughout the day. What does this mean? We are all busy people- whether you are juggling kids, freelance work, creative ideas, or diverse clients, we can sometimes get lost in our devices, calendars and apps that are supposed to help us live simply. I've tried a few different methods of list making and a few apps created specifically for task organization. By far, the one I would jump to recommend to my mom, my roommates and my coworkers is Todoist. It allows you to streamline all of your lists into one location. When you add an item on your phone, (as long as you have internet) it will sync to your computer or tablet. This eliminates redundant list making and saves you time from transferring things from one device to the other. You can actually attach a "priority" to the item you are adding to your to do list. This creates an order of importance among your list, helping you remember what the most important and potentially urgent items are. The feature of "assigning a task to someone" is extremely helpful for a team working towards a common goal. It streamlines the communication process, allowing the app to serve as the mouthpiece and explanation of a task as well as a calendar with a due date. It could increase your productivity as a group or team as it cuts out the email or phone call in between. Using the Todoist list for your tasks and daily duties, will create simplicity and space in your calendar. Instead of plugging everything you need to do in a day, into your phone calendar, causing it to look overwhelming and full to the brim- put your tasks in the Todoist list and enjoy the satisfaction of checking tasks off one by one. The list stays up to date. It will show you the current day, or the upcoming 7 days. This serves as a form of auto clean up and fresh start for each day. If items don't get completed "today", you can simply click and add it to tomorrows list. Todoist offers integration with over 50 other softwares and programs that will increase your ability to share and upload images or documents from other locations on your phone or computer. Image from Todoist Official Instagram. Check out why Hannah loves Todoist on a professional and personal level. Make 2015 fun...to look at. It's right around the corner - A Brand New Year! One of our favorite items to shop for this time of year is a new calendar. Calendars can be an easy & inexpensive way to brighten up a spot in the kitchen or office. 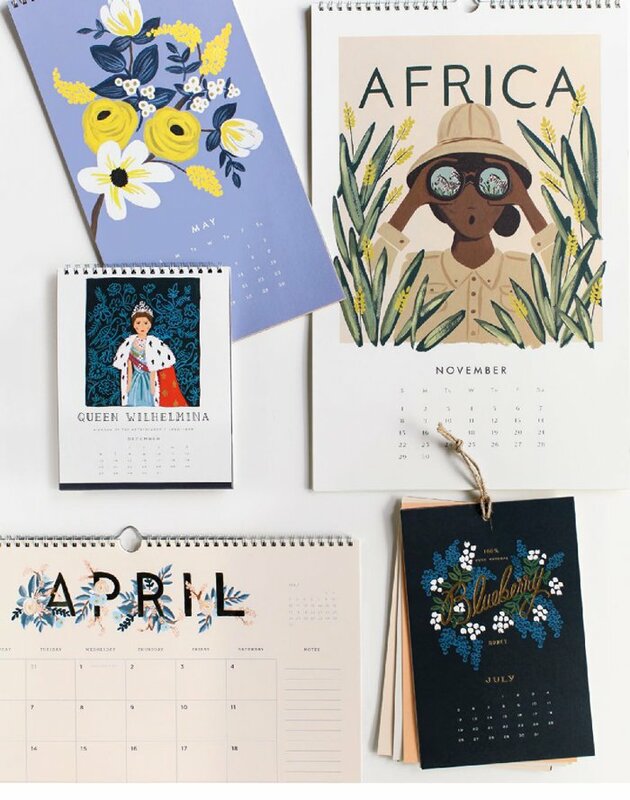 Traditional flip calendars, tea towels or creative letterpress calendars are just a few of the ways to keep your days straight & make your space look great! We've collected some our favorites to get you started. This Nikki McClure is wonderfully unique. Armed with an X-acto knife, she cuts out her images from a single sheet of paper and creates a bold language that translates the complex poetry of motherhood, nature, and activism into a simple and endearing picture.